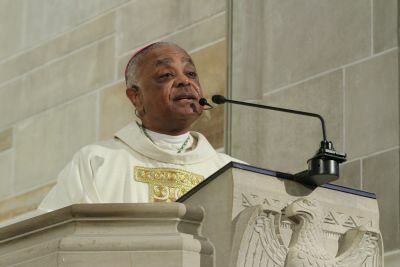 ATLANTA (CNS) — Responding to public and media criticism about his new $2.2 million residence, Atlanta Archbishop Wilton D. Gregory issued a statement of apology in his April 3 column in the archdiocesan newspaper. The archbishop acknowledged that he had received “heartfelt, genuine and candidly rebuking letters, emails and telephone messages” during the past weeks about his residence. “Their passionate indictments of me as a bishop of the Catholic Church and as an example to them and their children are stinging and sincere. And I should have seen them coming,” he wrote. The archdiocesan communications office has received more than 100 emails and messages, mostly positive, about the archbishop’s column. In his will, Mitchell requested that primary consideration be given to the Cathedral of Christ the King, where he worshipped. The cathedral received $7.5 million for its capital fund and spent roughly $1.9 million to buy the archbishop’s former residence. Cathedral officials have budgeted an additional $1 million to expand the archbishop’s former residence so its six priests can live there, freeing up space on the cathedral’s cramped campus. The cathedral rector, Msgr. Frank McNamee, asked Archbishop Gregory to sell the residence to the cathedral because it is in walking distance and parishioners strongly wanted their priests to be that close. The sale funds were used to build the new residence. An additional $300,000 went toward making it handicapped accessible and including a larger chapel than the one in the older residence. The home has four bedrooms, including a master suite. The downstairs level is designed for entertaining. It also has a two-car garage and additional guest parking. Archbishop Gregory moved into the newly built home in January. Some local Catholics reacted unfavorably to the move and articles in the Atlanta Journal-Constitution and other media outlets were critical of it. In his April 3 column, the archbishop said he would meet with archdiocesan consultative bodies in upcoming weeks to hear their assessment of what he should do about the new residence. He added that by example, Pope Francis has profoundly communicated the call to simplicity.